Within the education system, acts of violence toward animals take place and are manifested on a routine basis in science classes, in lecture halls, in school canteens, and during study visits to zoos, farms, and slaughterhouses. Taken for granted as ”necessary” for teaching and learning, this violence profoundly affects animals as well as students. It also provides new entry points for understanding education as a multispecies power regime, driven by numerous other investments than knowledge dissemination alone. What, then, is the nature of this educational violence, and how exactly does education work through techniques of interference with student and animal bodies? 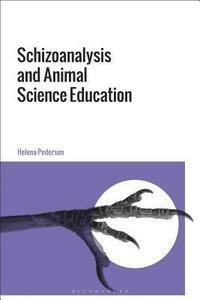 Based on ethnographic research within upper secondary schools and higher education, this book challenges the use of animals in education by innovative engagement of Deleuze and Guattari’s tool of schizoanalysis. Sparking a fundamental rethinking of educational processes, relations, and aims, the book explores how scientific knowledge about animals proliferates through complex interplay of power and desire in contested spaces of teaching and learning. Configuring animal science education as a set of machines working in tandem with the animal industry, Helena Pedersen offers radical new insights into how education forms subjectivities and social orders under conditions of capitalist expansion that capture students and animals alike. Bringing together education studies, science studies, critical animal studies, and continental philosophy, Pedersen also provides examples of disruptive action that can put education to work for transformation and liberation. This entry was posted on February 4, 2019, in books.